Has constant styling, unrelenting weather and daily life taken a toll on your tresses? Turn back the clock and bring condition and vitality back to your hair with the luxurious range of salon exclusive colour, care and styling products from Clairol Professional. Completely indulgent, yet available at prices that won't break the bank, the new ranges combine the ultimate in care and styling with eight decades of expertise, innovation and research that Clairol Professional is known for across the world. Central to all Clairol Professional innovation is its philosophy that hair is a living three dimensional material, which requires nourishment and care to flourish to its full potential.Whatever your hair dilemma - from dull to dry, flat to frizzy - the new line of Clairol Professional products partner nutrient-rich natural ingredients with special patented technologies to help deliver stunning transformative results to hair every day. For vibrant beautiful hues, look no further than Clairol Professional in-salon colour. The colour range of 90 permanent and 41 demi-permanent colours features revolutionary Vitaflection Microspheres™ technology to deliver luminous results alive with shine and vitality. - not to mention 100% grey coverage. 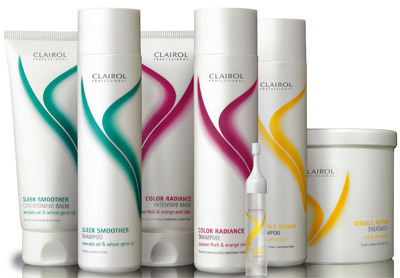 The Clairol Professional care range, which includes 44 products, uses exclusive Radialux Microion™ technology to target hair where it needs care the most. For styling solutions that last all through the day or night, Clairol Professional's salon-exclusive 3D-SculptT™ micro-polymer technology in its 23 styling products won't let you down. Designed to create body, lift and fullness, texture and definition or brilliant shine, the styling collection helps you achieve any desired style with ease. No matter what your hair type, condition or budget now you can treat yourself to the ultimate in luxury. Discover your local Clairol Professional salon today and awaken your hair to its ultimate living potential.